Danfoss Contactors CI 6 – CI 50 cover the power range 2.2 – 25kW. 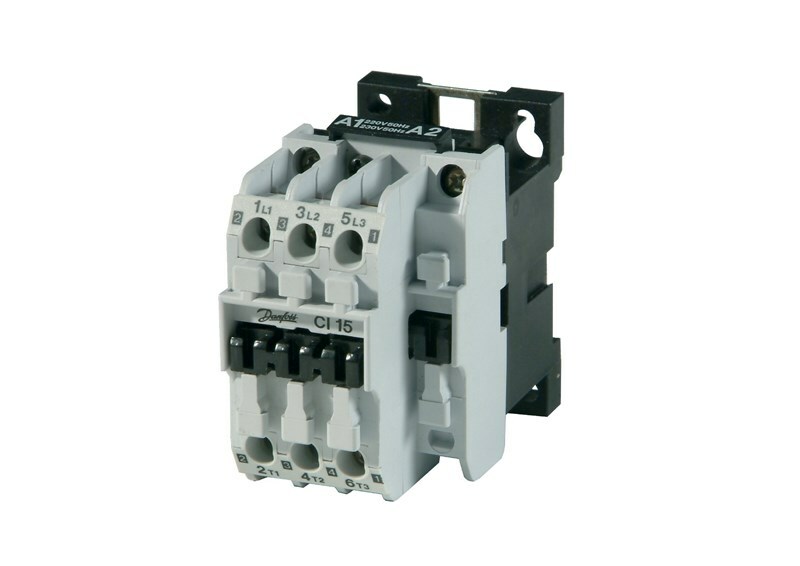 The contactor range is very versatile, with a wide range of contactors to suit a variety of purposes. The contactor programme CI 6-50 is based on three frame sizes. The smallest frame size consists of CI 6-15 (2.2-7.5 kW), the middle contains the CI 16-30 range (7.5-15 kW) and the largest frame size is represented by the CI 32-50 (15-25 kW). All frame sizes are provided with three NO main contacts. CI 6-15 are available with four NO main contacts. The CI 6 – 50 range is complete with a coil of your choice, ranging from 24V to 500V. Along with the coils, there is a wide range of accessories available, including – clip on auxiliary contact blocks, timers, interface modules and RC links. Please contact us to enquire about coils and accessories for the CI 6 – 50 range. Spring loaded contacts for quick-return. Usually comes in a push-to-make format, with most coming with 4NO contacts as standard. Interchangeable coils to make each contactor suitable for almost any application within industry. Rated from 6A up to 50A.